Did you know you could build models of animals using LEGO bricks? LEGO CREATOR 4916 Mini Animals (Note: now discontinued) was one such LEGO building toy set. 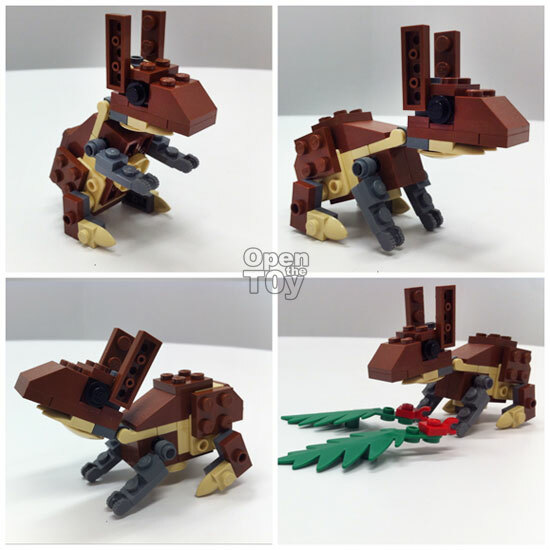 Tomáš Vít, a fellow MOC (My Own Creations) builder at http://buildinst.sweb.cz challenged himself to build new alternate models of animals, other than the official designs provided for this LEGO building toy set, with the same brick pieces. This is the Rabbit with Carrot animal model designed by Tomáš Vít. I think this is a clever model of the rabbit. The brick pieces provided in this Mini Animals building toy set allowed Tomáš to recreate the physical features of the rabbit accurately. The use of joint pieces allows the head and limb to move and prop the rabbit model nicely. Look, there are also “leaves” and “carrot” brick pieces for the “eaten carrot”. Unfortunately, there are no red stud pieces to use for the rabbit’s eyes. Else, this Rabbit model would look even more accurate. LEGO and MOC builders have never ceased to amaze me with their creations. I look forward to review more of such MOC models designed by fellow builders. Thanks YeeTat for sharing and reviewing!